Konami has posted an update on Metal Gear Solid V: The Phantom Pain's non-progression bug. Earlier this week, Konami warned players of Metal Gear Solid V: The Phantom Pain of a bug that corrupted game save data under specific circumstances. The bug affected saves when players brought Quiet as a buddy for Mission 29 and Mission 42. This issue is known to affect the game on all platforms. 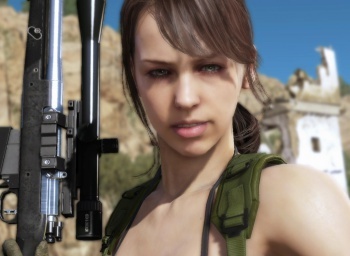 Konami has posted an update, informing players that they can still safely use Quiet in these missions if they use the Butterfly Emblem throughout the mission, or avoid raising their Bond Level with Quiet to MAX during the course of the mission. "The team is currently working on a patch to fix the bug and repair any save data affected by the issue," the post continues. "Further updates will be announced soon. In the meantime, we apologize deeply for the problem and thank you for your continued patience as we work to resolve the issue." Metal Gear Solid V: The Phantom Pain released on September 1 for PC, Xbox One, Xbox 360, PS4, and PS3.